Touchstone Mounted Electric Fireplaces!! HOTT!! TWO HEAT SETTINGS: Perfect for the cold seasons, the Touchstone Sideline features two heat settings: high and low. Heat vents are located on the upper front area. The heat level can be adjusted according to the user's preference, making this fireplace a functional and practical fixture. The fireplace can be turned all the way up in freezing weather to keep you snug and toasty. For slightly chilly weather, it can be set on low to provide ample warmth without getting too hot. FAUX FIRE LOG AND GLASS CRYSTALS: This set includes faux fire logs and crystals to create an authentic feel. It operates on 1,500 watts, with a voltage of 120. The recessed unit has a room coverage of 400 feet. This fireplace should be positioned at least 12 inches below the ceiling. Avoid mounting it directly under a flat-screen television, as that may limit the heater's use. 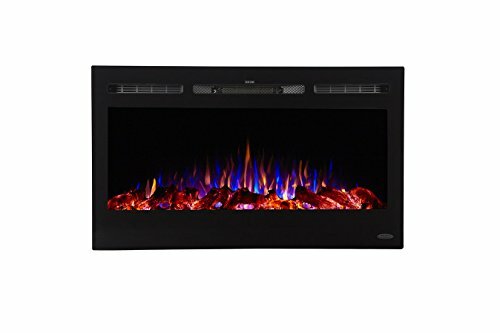 Touchstone Sideline Recessed Mounted Electric Fireplaces (36 Inches), Touchstone Home Products, Inc.